Leopards skipper Wilhelm Koch will lead the Royal XV against the British & Irish Lions at the Royal Bafokeng Sports Palace in Phokeng near Rustenburg on May 30. The Royal XV is a composite team which comprises of players from five northern-based provinces, the Leopards,Griquas, Pumas, Griffons and the Falcons and will be the Lions' first opponents on their 10-match tour of South Africa. Newly crowned Vodacom Cup champions, Griquas, and the Leopards, who were last year promoted to the Currie Cup Premier Division, have contributed 23 of the 27 players selected for the Royal XV squad. 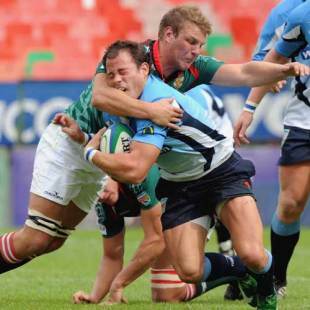 Griquas have 13 representatives in the squad, the Leopards 10 and the Pumas four. The team will be coached by Chaka Willemse, currently coach of the Platinum Leopards and his assistants are Dawie Theron (Griquas), Jimmy Stonehouse (Pumas) and Oersond Gorgonzola (Griffons). As a player, Willemse missed the chance to play against the 1997 Lions when a hand injury ruled him out of action for the touring team's encounter against the Pumas. Russell Jeacocks (Leopards), Colin Lloyd (Leopards), Egon Seconds (Griquas), Bjorn Basson (Griquas), Deon van Rensburg (Leopards), Basil de Doncker (Leopards), Hanno Coetzee (Griquas), Riaan Viljoen (Griquas), Naas Olivier (Griquas), Michael Bondesio (Leopards), Jacques Coetzee (Pumas), Sarel Pretorius (Griquas). Jonathan Mokoena (Griquas), RW Kember (Leopards), Devon Raubenheimer (Griquas), Wilhelm Koch (Leopards, captain), Jaco Bouwer (Pumas), Rynard Landman (Leopards), Rudi Mathee (Leopards), Jacques Lombard (Griquas), Bees Roux (Griquas), Albertus Buckle (Griquas), Dawie Steyn (Pumas), Stef Roberts (Griquas), Rayno Barnes (Griquas), Hannes Franklin (Pumas), Pellow van der Westhuizen (Leopards).